I would dare to guess that many of you are like me and take supplements with the hopes that they are beneficial to your health. Many of us also give supplements to our pets. Through all of Tara's health problems, especially her heart disease, I did a huge amount of research on supplements, and I strongly believe that they kept her with me for far longer than the doctors thought possible. I recently came across a fascinating infographic containing information on treating feline diabetes with natural herbs and supplements with the guidance of your vet, and decided to share it here in honor of Pet Diabetes Month. Check it out and then we'll chat more below. Many of these supplements I had never even heard of, but because of Tara and a prevalence of heart disease in my family, I do know a bit about the supplements that benefit the heart, such as Omega-3 and Vitamin E. Cardiovascular disease is also the leading cause of death in diabetics. 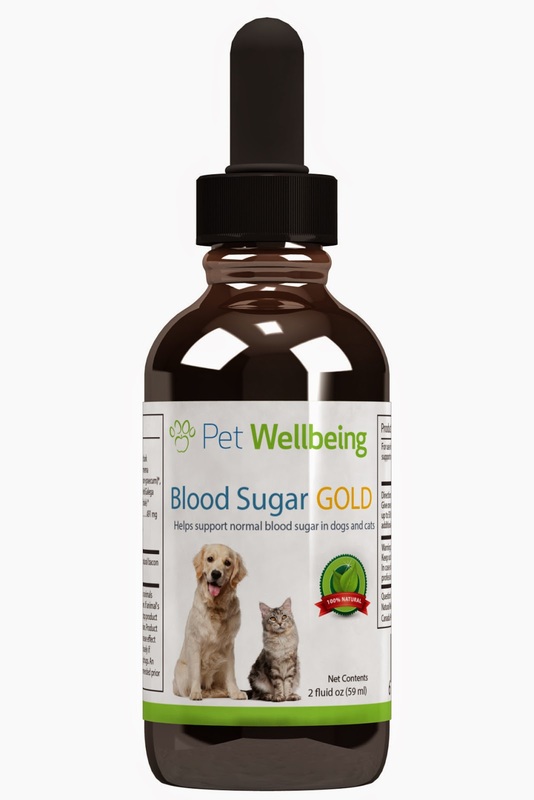 A more convenient way to provide natural support for feline diabetes is with an already prepared blend, such as Blood Sugar Gold - Cat Diabetes Support, a unique formula developed for times in a cat's life when stable blood sugar and insulin levels are needed. Using the best known botanicals for blood sugar maintenance, it also contains herbs to support a healthy liver and eye health. Cats taking Blood Sugar Gold may respond by having healthy amounts of urination and normal thirst. Appetite within a healthy range is also common when insulin levels are maintained. Normal weight, good energy and/or good vision may also be maintained. If your cat is taking prescribed medication such as insulin, please read through the precautions for Blood Sugar Gold. It is of utmost importance that blood sugar levels be kept in a healthy range and not get too low. * Devil's Club root bark: This indigenous North American herb has vast uses. Maintenance of normal blood sugar levels is one of its most powerful applications. It has also been used traditionally by First Nations Peoples for the respiratory system, for joints, the digestive system and as a general health tonic. * Gymnema leaf: With the addition of this herb to the formula, there is specific support to the beta cells of the pancreas and also to maintain healthy blood sugar levels immediately following consumption of food. * Fenugreek seed: A seed used extensively in India for health and nutrition, recent studies concur that healthy liver and insulin levels may be linked with regular ingestion. * Burdock root: High in inulin, Burdock has been used traditionally to support healthy blood sugar levels, support the liver and for good digestion. * Goat's Rue herb: Used and grown in Europe for hundreds of years, this herb may allow the body to better tolerate carbohydrates. It is also one of the main plants used for maintaining healthy blood sugar levels. Its secondary ability to support the liver makes it a valuable addition to this formula. * Dandelion root: Both leaf and root are commonly used in herbal formulas. The root's therapeutic actions are as a pancreatic regulator, cholagogue, for pancreatic and bile duct stimulation, and portal circulation. * Bilberry fruit: Rich in anthocyanins, these berries are considered a wonderful food source of antioxidants. The extract is known to affect the tiny blood vessels that supply the eyes. It also shows specific action in maintaining healthy blood sugar levels. 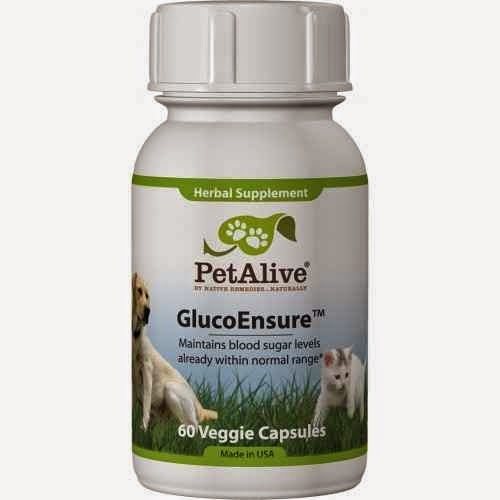 Another popular blend is PetAlive GlucoEnsure, which contains a variety of helpful nutrients and herbs that can support the animal’s system and possibly reduce the amount of insulin required. Active Ingredients - Bilberry (fruit), Goats rue (herb), Fenugreek (seed), Astragalus (root), as well as chromium, a mineral supplement which has been clinically proven to improve the effectiveness of insulin. It also helps in the breakdown of fats and can therefore balance cholesterol levels and reduce the risk of heart disease. 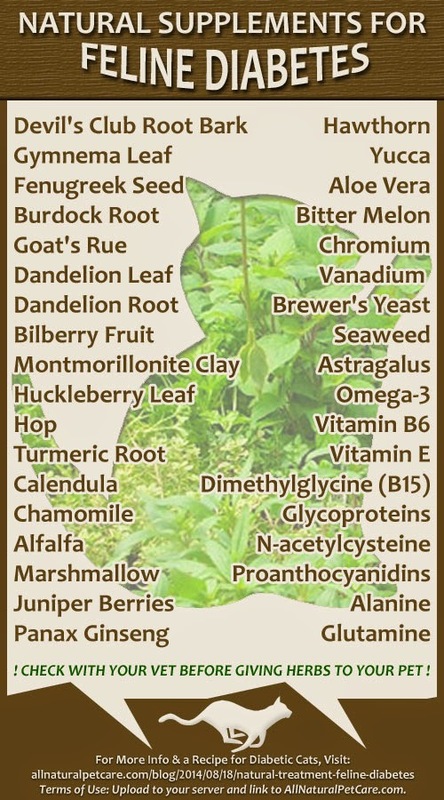 Have you ever used herbs, extracts, or dietary supplements on your pet? Did you find them to be effective? As the infographic states, it is extremely important to check with your vet before giving any herbs to your pet because cats can be highly sensitive to certain herbs and essential oils. Your vet also needs to be aware of any natural methods you are using in order to avoid drug interactions and to adjust insulin requirements accordingly. We use lots of supplements and consult two vets. Our holistic vet knows what will work and our other vet is more traditional. It's important to have a source you can trust. There were several herbs our Mommy had never heard of too. She's definitely gonna save this for future reference. Gweat posty. Weez hav a furiend dat has a lot of kitties wiff diabetes. Weez gunna pass along yous posty to hers. I don't have any diabetic cats, but it's good to know there are natural supplements that might help them. This is good to know. We've used supplements in the past...not for diabetes...but for some other issues. They can be another way to treat along with traditional methods. Thanks, Melissa. I take glucosamine, for my knees, and my vet said it would be okay to give to my old dog, too. He gets half a tablet a day. I hope to never need this for my kitties, but I will save the information just in case. This is really interesting stuff. We've had diabetic kitties in the past, and we wish we had now about these supplements then. Abby used slippery elm the last 2 years of her life and it really helped her with her bowel problems. TW doesn’t take vitamins except D3 and some probiotics. Oh yeah, sometimes she’ll use Melatonine to help her sleep. She won’t mess with my food or schedule. She tried using Rescue Remedy on me once but it didn’t work too well. I tend to get worked up and barf. Glucosamine worked WONDERS for the cat who came before. And Maxie's stomatitis is being helped by herbal additives to the water. And holy CAT the pheromone diffuser worked sooooooo well for us when we went on our photo shoots! Bibliography - Paul, B. 2018. “Test RX Review: Benefits, Side Effects & Where To Buy Guide!” Testosteroneofficial.Com Ie. Testosterone Official. Accessed October 29. https://testosteroneofficial.com/reviews/test-rx/. Let's go with DOCTEUR TAYLOR AVIS hope this can be done. Thanks, Melissa. It's good to know your info. This need to be shared to people who have diabetes.